1. Go to http://live.gearsofwar.com and wait for the stream to load up. 2. Click "Log In", which you can find in the top right corner. 3. Sign in with your Xbox Live account information. 4. Once you've signed in you should return to the main streaming site. Now all you need to is click the "Quests" tab to get started! WHAT TYPE OF QUESTS ARE THERE, AND HOW DO I COMPLETE THEM? There are two different types of polls. One in the top right corner (above the chat/quest panel) and one poll in the bottom left of your screen. There are two ways to complete the Retweet quests. One way to do this is through the Twitter Tab underneath the chat, and the other is through a pop-up in the bottom left of your screen, which will appear at random. 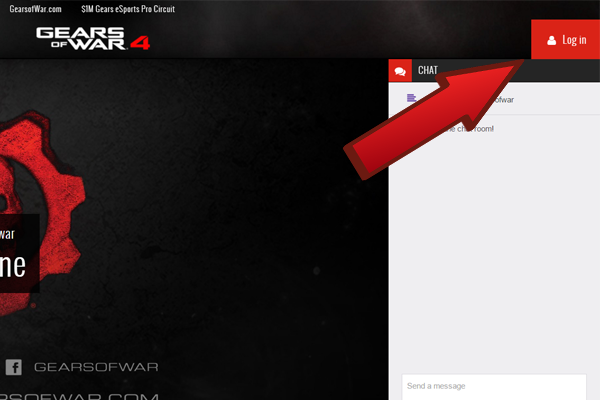 Note: You NEED to do the retweets through live.gearsofwar.com else it does not register! There is one way to share a Facebook post, hover over the "Share" button and click on the Facebook logo. You will be redirected to Facebook where you can share the Facebook post. WHAT TO DO ONCE I COMPLETED A QUEST? Once you've completed a quest your quest will unlock an "Submit Entry" button, simply click this button to be in the running for the prize! Question: I do not see any quests? Answer: Quests are no activate all the time, We will have the quests up as soon as possible once the broadcast is live! Question:I was working on a quest, but now it's closed! Answer: Some quests may close and some may become active between matches, so make sure to submit your quest as soon as possible! Question: I voted on a poll, but it did not register my entry! Answer: Make sure you are logged in onto the live page! if you are not logged in it sometimes does not register. Question: I voted on a poll, but it did not register my entry but I am logged in! Answer: Sometimes the program does not register a vote, a problem Maestro is currently looking into. Unfortunately, that means we can't fix it for you, however do not worry! We will do enough polls throughout the broadcast to make sure you are able to complete the quests, granted you're in the broadcast long enough. For instance, if you come into the broadcast in the final match, you won't likely be able to complete a quest asking for 10 polls. 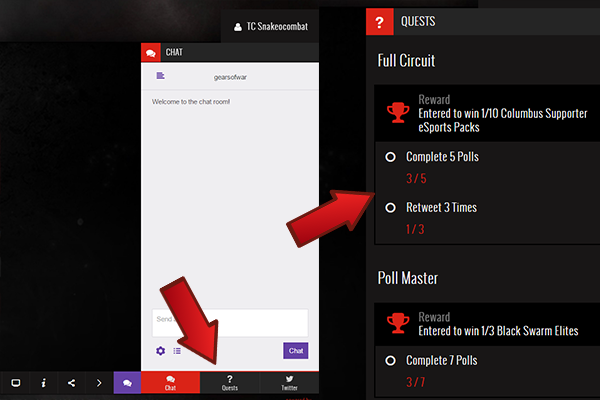 If you watch the entire broadcast, on the other hand, you will be given more than enough polls to complete any quest. Question: I do not see any polls? Answer: There is always one poll active in the top right corner of your screen (Above the chat/Quest Panel), the polls in the bottom left of your screen is being done at random. So pay attention! You might miss it! Question: When will you be doing another poll? Answer: All polls are being done at random, but do not worry. We will make sure there are enough polls for you to answer throughout the broadcast. Question: My Retweet did not count! Answer: Make sure you are logged in into Twitter.com, if you are not logged in it does not register. Question: My Retweet did not count while being logged in into Twitter! Answer: Make sure you did not Retweet the Tweet already. If you did, undo the Retweet and try again. Question: I clicked the "Submit Entry" button last week, but I did not receive my reward! Answer: The prizes are not guaranteed (unless this is stated in the quest). Once you completed the quest you are being entered into the giveaway. Question: How do I know I won a prize? Answer: If you have won one of the prizes you will receive an Xbox Live Message from a Gears Esports team member (on the Gears Esports Gamertag) within 7 business days. If it's a physical prize, or one that otherwise requires your input, then you'll have 2 weeks to claim it otherwise it may be forfeited. Question: What Xbox Gamertag will contact me if I won? Answer: Either Gears eSports or Snakeocombat. Question: None of the quests/features works! Answer: Try to logout and log back in, if this does not work try a different web browser. Question: I need more support for this website!